Our colleagues over on MusicRadar publish in-depth music-making hardware and software reviews from industry expert magazines Computer Music and Future Music. 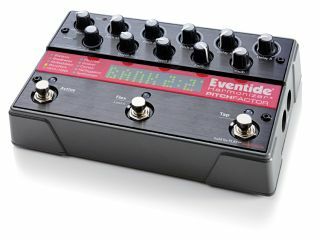 Eventide's expertise with pitch-based effects shines through here – PitchFactor offers lots of control by hand or foot and high-quality sonics throughout. It's pricey but it's worth it. A compact and rugged audio interface – not the cheapest, but certainly one of the highest quality in its class. An iPhone/iPod touch real-time effects processing tool for loops offering a fine degree of control and, most importantly, good fun. This MIDI Recorder takes audio input from either the built-in mic of your iPhone or an external mic on the iPod Touch and attempts to turn it into MIDI note data. Unfortunately, while being attractive on paper, in practice, it falls short. A unique synth that specialises in movement using a novel and powerful timeline system. Guaranteed to thrill those seeking a fresh perspective on synthetic sound design. A splendid cinematic ROMpler - inspiring to play and featuring a wide range of textures and sonic 'worlds', Used in tandem with Kontakt 4, it becomes an even more powerful library. Superior Drummer 2.0 gets another shot in the arm with a classy add-on that contains samples of extremely sought-after drum hardware.